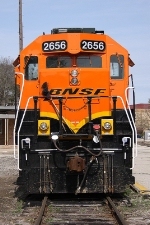 Title: BNSF SDP40 #6327, GP15. rebuilt 35's, etc. Description: One of four early patch test beds. Description: Emporia "In town" switcher. Description: Eastbound 16 car switcher heading to the east side of town to switch industries.